This year it’s founders Butlers in the Buff and Hen Heaven decided to find the UK’s Best Bridesmaid to commemorate the occasion. he was nominated by her best friend and bride Harrie Cater-Pugh. Harrie suffers from a rare disability that cause her joints to dislocate easily. This means she needs crutches and sometimes a wheelchair to get by. 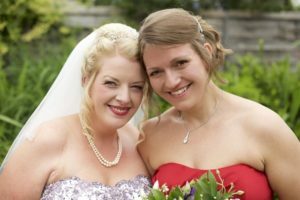 The pair have been friends for 15 years and it was Rachel’s knowledge of Harrie’s condition that made her the perfect person to organise a hen do that Harrie could enjoy and look after her on the big day itself. As any bridesmaid will know, organising an awesome hen weekend is one of the biggest tasks they have and for Rachel she had to make sure that the hen weekend was fun and also inclusive to Harrie’s limitations. 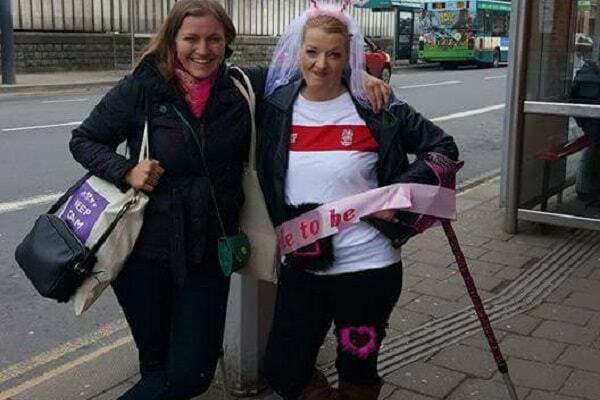 The hen party went to a England v Wales rugby match and even toured the Principality Stadium. In great hen do tradition Harrie was fake arrested and forced to wear an England shirt (she is a Welsh supporter), which made for some great stories and pictures. The hunky players also ticked the box of seeing some muscle on the weekend! After rugby a cocktail making class and an 80’s themed night out including tickets to see Dirty Dancing in the theatre rounded it off nicely. Rachel organised all this on her own from Edinburgh. As well as the hen party Rachel also helped the bride in every way for the wedding. Finding the UK’s Best Bridesmaid was a nationwide search with brides nominating their friends for the award over the last few months. 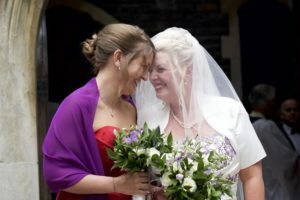 The story of Rachel Burton and her friend Harrie’s wedding made her a cut above the rest. She perfectly epitomises what being a bridesmaid is all about with her excellent organisation skills and sacrifices to make sure everyone, especially the bride, has the best time on the hen weekend and the wedding goes smoothly. Wanting to delve deeper into the world of bridesmaids we also ran our very own survey, asking 1000 former customers and bridesmaids about their experiences in the important role. There were certainly some interesting discoveries and insights in how bridesmaids think. – The best part of being a bridesmaid was playing a part in their friend’s big day with 41% saying so. – The worst part about being a bridesmaid was the financial costs according to 51% of those asked. – 26% of those surveyed said they had been a bridesmaid three times in their life. 22% said twice and 14% said four times! – 62% of hen do’s stayed in the UK, while 38% went abroad. If you want to know a little more about the world of bridesmaids, then check out our 2018 stat pack! • The average number of bridesmaids at a wedding is 3! • The largest number of bridesmaids at a single wedding was 168 in a 2015 Florida wedding. • Over 250,000 hen parties took place last year. That’s a lot to organise for bridesmaids. • Average age of someone getting married in the UK is 31 for a woman and 33 for man.